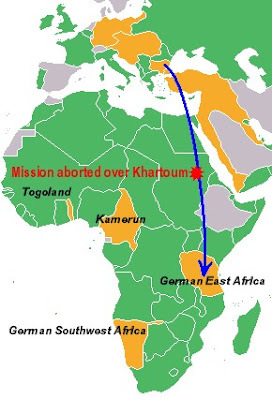 In the infant days of aeronautics, the Germans attempted what was perhaps the earliest long-range airlift operation in history, the 1917 mission to send supplies from Europe to German East Africa, a flight of over 3600 miles. Unfortunately, this amazing story remains a forgotten episode of the little-known East Africa theater of the First World War. Colonel Paul Emil von Lettow-Vorbeck leading his colonial troops. At the start of the Great War, Germany's African empire consisted of Togoland (modern-day Togo), Kamerun (Cameroon), German Southwest Africa (Namibia), and German East Africa (Tanzania, Rwanda, and Burundi). These colonies each possessed only very small military forces of German-led native troops, and with British control of the oceans, it is inevitable that they would be eventually overwhelmed. By 1916, all of the German colonial forces had been defeated—except in East Africa. There, an army of less than 3,000 led by Colonel Paul Emil von Lettow-Vorbeck conducted a successful campaign against the British, eventually tying down over 50,000 Allied troops which otherwise might have been sent to the Western Front. Although the British hacked away at East Africa and Lettow-Vorbeck was continuously forced to yield territory, his army fought a successful guerilla war and never lost a single battle. 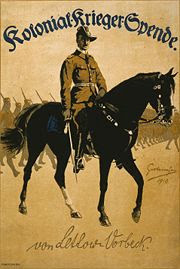 In 1919, his army was allowed a victory march through the Brandenburg Gate with the distinction of being the only undefeated German army of the war, and the only German army to successfully invade British territory (Nyasaland and Northern Rhodesia). By late spring 1917, the war in Europe was grinding into its fourth year. The Western Front was still locked in bloody stalemate, Russia is trying to recover from the February Revolution, and Lettow-Vorbeck is being pushed into an increasingly smaller Tanzania--his troops are being forced into the bush, their medical supplies were running low, and they were short of every sort of ammunition and equipment. That's when the Imperial German Naval Airship Division examined an interesting proposal to send the much-needed supplies by air. Though the required distance was unprecedented, they believed the mission possible, and the Kaiser gave his personal go-ahead for the project after briefing. The Navy had taken much of the blame for recent entry of America into the war, and felt the airlift, which is of obvious propoganda value, could restore its prestige. Besides, the Colonial Office felt it was an important matter of honor to still be in possession of at least one of its colonies by the conclusion of the war. Because there were no ready supplies of hydrogen or petrol once the airship reached East Africa, the mission would neccesarily be a one-way trip. Upon arrival, every aspect of the airship would be cannibalized: the leather walkways around the hull would fashioned into boots for the troops, the duralumin girders and fabric outer covering would be used to make tents for the army, the radio equipment, petro tanks and engines would be reassembled into a radio station, and the crew were to join the 300-odd European German officers in the colonial army as infantrymen. Although normally a difficult mission like this would be commanded by somebody more experienced, the Naval Airship Service did not wish to lose one of their few remaining veteran commanders in this risky mission, so the relatively junior officer Kapitanleutnant Ludwig Bockholt was appointed to command. As for the aircraft itself, the job was given to the next zeppelin laid down at the Friedrichshafen airship factory, designated L.57. To provide additional lift so that it could carry a heavier load, the hull of L.57 was elongated by 30 meters, thus increasing her gas volume from 1.9 to 2.4 million cubic meters, making her the largest airship built up until then. However, during the second trial flight outside Berlin on September 26th, the zeppelin ran afoul of the weather when it attempted to land, and it crashed into the ground and exploded. Though the crew escaped safely, the airship itself was completely destroyed. The Naval Airship Service therefore reassigned the mission to the next airship under construction, L.59, which was prepared the same way as its ill-fated sister. After passing its preliminary testing, L.59 embarked on its unusual mission on November 21, departing from Jamboli in allied Bulgaria, which was the southernmost air base available to the Germans. Mission: Supply and reinforcement of German colonial troops in East Africa. Officially, the project was code-named "China-Sache" ("China-thing") and preparations had been kept under tight secrecy, but rumors had been spreading for some while among the British that the Germans were planning to use airships to support Lettow-Vorbeck and induce the native population to rise against the British colonizers. According to Dr. Mike Benninghof, the idea appears to have originated with Zulu preachers from Natal in 1915. Inspired by newspaper accounts and pictures of zeppelin raids on London, the holy men declared airships the symbol of God's displeasure with the British. Mighty fleets of zeppelins were being assembled in Europe, they told their followers, preparing to bring modern weapons and German crack troops to aid the native population in throwing off the oppressive yoke of British rule. The British, for their part, took these rumors very seriously. When in November 1917 they captured SMS Königsberg Captain Max Looff among a group of injured and ill soldiers left behind by Lettow-Vorbeck, the worst rumors were fearfully confirmed. Recovering from his initial surprise at the questions about German zeppelin plans for Africa, Looff informed his gullible interrogators that large squadrons of the latest high-tech airships were coming, each with enough capacity to transport several companies of battle-hardened marines and heavy equipment, all the while (I imagine) trying to put on the straightest face possible. No airship could transport troops, as anybody who had actually seen a zeppelin could tell the idiots questioning Looff. Das Afrika-Schiff, as L.59 was nicknamed, was three times the length of a Boeing 747, but it could only carry 14 tons of cargo: 11 tons were equipment and ammunition, including 30 new machine-guns, and the rest were medical supplies. In addition, it carried 22 tons of petrol fuel and 9 tons of water ballast. Its crew of 22 lived under spartan accomodations and high-stress work conditions--each of the five propeller engines required a mechanic in attendance, and was shut off in turn for 2 out of every 10 hours for lubrication and maintainence. L.59 flew over Turkey without incidence, but ran into an electrical storm over the Mediterranean, causing the lookout to raise the false alarm that the ship was on fire. The zeppelin's hull flashed and glowed blue, but it was only St. Elmo's Fire caused by static charge. During the storm, however, the crew retracted its radio aerial as per standard procedure, and was thus put out of contact for the time being. Back in Berlin, officials working off fragmentary reports believed Lettow-Vorbeck had been overrun and his army had surrendered, and sent out abort orders which were not recieved. While it is true a large portion of Lettow-Vorbeck's army had indeed surrendered, he had not, in fact, been overrun. He had simply ordered the weak and disabled (including the aforementioned Max Looff) to stay behind to surrender while taking with him only the hardened veterans to continue the grueling fight in the bush. Nevertheless, once the airship arrived, establishing radio contact with Lettow-Vorbeck would be difficult and trying to make a successful rendezvous by guesswork when your own side is waging a guerilla war would be highly risky. The next morning, L.59 crossed the Libyan coast and continued over the desert (For a fanciful depiction of the zeppelin over Africa, you can go see this painting on sale). It was the first time a large airship was employed in the tropics, so the crew encountered several unfamiliar difficulties. During the day, the oxygen in the gas cells were heated by the hot sun, generating extra lift, causing the crew to struggle to keep the airship flying below 2,500 feet. Bockholt knew that if the zeppelin flew any higher, the gas pressure inside the ship would exceed that outside, and valves would automatically open to release hydrogen from the gas cells, and he could not afford to lose any of the precious lifting gas. Hot air thermals rising from the desert caused the airship to rock up and down continuously, so much that even the most seasoned Navy men among the crew would feel airsick. In addition, the crew complained of headaches caused by the blinding sunlight glancing off the desert sand. During the afternoon, another more serious problem developed: the forward engine malfunctioned beyond repair, and had to be shut down. To compound this problem, the forward engine also provided the power for the radio transmitter, so the mission is now unable to communicate with either Berlin or Lettow-Vorbeck. Limping on only 3 engines (remember at any one time, 1 of the remaining 4 engines is offline for maintainence), the airship passed Egypt on the second night and continued on through the Sudan, navigating with the aid of the Nile. While the mission was approaching Khartoum, the morale of the crew soared, with the end in sight and the chance of success increasing by the hour. Though they had endured two days of little sleep under the scorching sun and subzero night temperatures, the spirits of the 22 crew members were buoyed by the prospect of bringing relief to their beleaguered countrymen and scoring a major propoganda victory for Germany. But it was not to be. The amazing zeppelin airlift of L 59. Orange indicates Central Power-held territories at the start of the war. The next day, the airship's radio receiver finally picked up the dim abort message from Berlin. It was a devastating blow to the men who had flown 2,800 miles and came so close to pulling off what was perhaps the most daring airlift operation of all time. Captain Bockholt had no choice to order the ship to turn around and head back to Jamboli. The morale crash showed in the men--several of them developed nervous tension and feverishness. On the way back through the desert, the airship experienced a very close shave at night due to the cooling and contracting of the hydrogen. The ship stalled and nearly crashed, but it was kept in the air only when the ballast and some of the cargo was jettisoned, leaving the crew much shaken by the experience. After another loss of lift crisis over the mountains of Turkey which caused Bockholt to throw more cargo overboard, Das Afrika-Schiff finally arrived safely in Bulgaria. Since the radio transmitter on board was broken, the zeppelin could not reply to the abort message, and in fact over the past few days the command in Berlin were getting worried about the safety of the mission due to the radio silence. When L.59 returned to Jamboli, on November 25th, the base was taken by surprise and scrambled to receive it. Though they had not successfully delivered the supplies to East Africa, the exhausted captain and crew that climbed out of the craft should have nevertheless been proud of their achievement. They had not slept for 95 hours, covering a total distance of 4,200 miles and thus breaking by a large margin the world record for distance flown. After the war, a British intelligence officer named Richard Meinertzhagen, who was serving in East Africa at the time, claimed that the airship's turnaround was actually achieved by fake abort messages sent out by the British. However, the German military archives do show that they had in fact sent out an abort message. Whether L.59 picked up the authentic German transmission or the British decoy, it wouldn't have mattered--On the day the airship turned back, Colonel Lettow-Vorbeck and his band of die-hards left German East Africa, waded across the Rovuma River into Portuguese Mozambique and began waging his most successful campaign in the war. On the first day of his invasion, Lettow-Vorbeck looted ammunition and supplies from Portuguese depots amounting to several times the cargo L.59 would have delivered. This was really interesting, like all the other blogs you have. good job tony, im impressed by what youve done here...looks like a lot of work. A really engaging post, I must say. It kept even a history non-enthusiast like me interested. Also, that was an adorably succinct ending. I always found it fasinating that Lettow-Vorbeck was able to hold out so well against the british, although much of it was down to total incompetance on behalf of the british. He was a very good commander though and even surrended after capturing the last town of WWI. I am sure is he had recived more support from germany it would have been possible to cause the entente powers far more dammage. A very good post. One key to Lettow-Vorbeck's success was the way he treated the German Askaris (native troops). Unlike the British officers and men who treated their Askaris with the stereotypical British snobbiness, the Germans treated their natives so well that many British Askaris defected to the German side. After the war, Lettow-Vorbeck did indeed go back to Germany a real hero. So much a hero, in fact, that Hitler's people asked him to join the Nazi party and show the flag pre-WWII. He refused, and stayed quiet during WWII. Then, in the 1960s (that date could be wrong), he actually took his own money to Africa to pay back wages to his Askaris. Many of those Askaris had long ago lost any proof of service in the German army. But one of Lettow-Vorbeck's officers stood off to the side and barked some command in German (I forget which), and those who snapped to attention in the old style got their money. A true gentleman from a time when there were true gentlemen associated with the military. Do you have any information about a bombing raid by a Zeppelin on a place called English Mountain in Ssananga, I have a small award dated 19-20 Jan. 1917 for such an attack. I cannot find any evidence apart from this award to substantiate it. I know of no german airship that did any bombing in Africa, only the L-59 tried Alexandria once after a rebuild following the Africa mission, but did not succeed. After bombing Naples, it finally went towards Malta on its last mission. If you hear anything about Ssanaga (?) please write. Where did you read about that ?